The Doha Virtual Stock Market is a web application that simulates stock trading on the Doha Securities Market (DSM). By creating and managing stock portfolios, users experience trading on the Qatari stock market. This started out as a class project and evolved to successfully run a stock-trading contest at Carnegie Mellon Qatar. It began when the Business Student Association (CMBA) asked our web application class to create and pitch stock-trading platforms to them. They would use the best one to run a competition. As an aspiring software developer at the time, this was exciting! My buddy Khalid and I rapidly built the core features: buying and selling stocks, viewing transactions and tracking specific stocks through a “watch list.” There was no API to get the latest market data. So we wrote a script that went to the DSM site, “typed” in a stock quote and parsed the cryptic HTML that it spewed out. 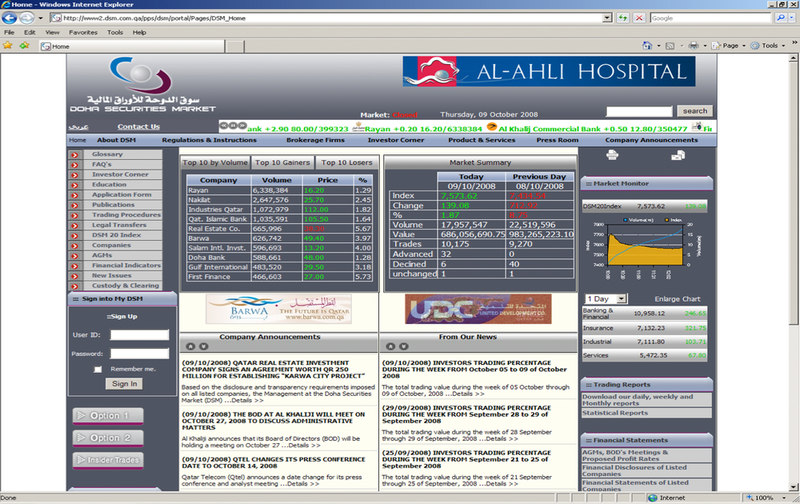 The Doha Securities Market website circa 2008. We were determined to make our application stand out. We knew that many business students bookmarked the Tepper website. The aesthetics of that site really stood out for me. Something about the layout, colors and fonts just felt “professional.” This contrasted with our site’s vanilla design, which was little more than tables and text. We decided that our site had to look professional. It had to feel prestigious. However, we didn’t possess the HTML/CSS wizardry to create it from scratch. So we took Tepper’s website, split its source code and hacked together what we needed. A visual re-edit, if you will. We were excited but nervous—while we hacked away on visuals, something looked at condescendingly by many engineering students, others were building sophisticated functionality. Users can choose to take advantage of a stock “watch list” to keep a pulse on specific stocks. The home page provides an overview of the application and lets users log in. One can sign up easily with their email address. A portfolio overview page shows users how their stocks are doing. All transaction history is archived and available to view at any time. During demo day, we opted to go last. If our design was truly a differentiator, it would stick more if we presented last, we thought. One by one, teams took stage. Some had complex-looking graphs. Others had crazy animations. One or two crashed during the demo. Our turn: we focused on design, talking about how the site needed to look professional and suit the tastes of the business students. How it had to be straightforward to use. CMBA loved it, and we won! We worked with them to ready the application for their competition: improving robustness, polishing the design and adding features like a public scoreboard that could be “turned off” sometime before the finale to create suspense. During the competition, 22 teams comprising 67 students, faculty and staff, were given QAR 150,000 in virtual cash to trade on our application. They traded stocks, made money and lost money. It was so much fun that the competition got extended by two weeks! It was the first time people used something that we created. The most important thing I learned was that looks mattered: when a product is built to suit an audience’s tastes and aspirations, it resonates phenomenally with them. I have fond memories of the project. I created it with one of my best friends under the mentorship of the fantastic Mark Stehlik and Meg Richards. We coded late into the night cause we were excited.